Send lots of love and kisses (with a few super cute photos!) to all of your friends and family with these photo save the dates. 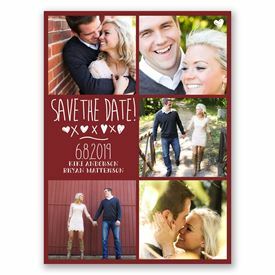 "SAVE THE DATE" and design are printed as shown in white. Background and wording are printed in your choice of colors and fonts. Envelopes are included. 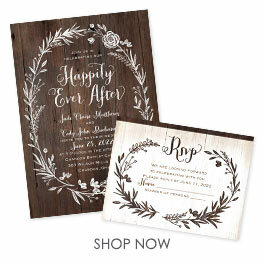 Make these into save the date magnets with just a simple upgrade in paper. My save the dates come out so much better than I could have imagined especially for the wonderful deal I got. Customer service was fantastic and I received my order very quick! I for sure plan to order my invitations from here as well.